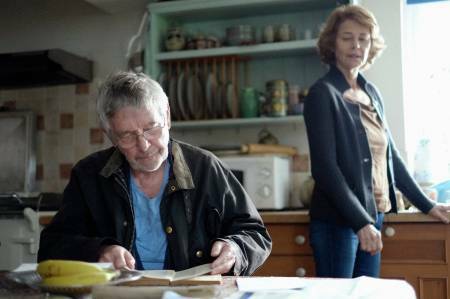 Andrew Haigh's 45 Years is adapted by him from the short story "In Another Country" by David Constantine about how a strange discovery from the past (and another country) disturbs a seemingly long and placid English marriage. In a way, this is a global warming story. Geoff (Tom Courtenay) has just received a letter in German about melting snow in the Swiss Alps. Down in a fissure frozen in ice laid bare by the melting, authorities believe they have found the body -- perfectly preserved from fifty years ago -- of Katia, Geoff's girlfriend from before he met his wife of 45 years, Kate (Charlotte Rampling). When Katia fell to her death, Geoff was traveling with her. As a result of this news, Kate begins learning disturbing truths about Geoff only a week before they are going to attend a big celebration of their long marriage. The days between the discovery and the party pass quietly but devastatingly before us, heralded by intertitles like steps toward doom or stages in a battle. As was clear in his excellent debut film Weekend, Andrew Haigh excels at small moment-to-moment details and knows how to cut close in depicting a relationship. Nothing could cut closer than this. Yet the film reveals how people are mysteries to each other, even after so many years, and mysteries to themselves. And the low-keyed film is itself a bit of a mystery, and ultimately seems a miracle. The scenes unfold with such a humdrum and routine air the actors don't seem to be acting at all, which of course means that thay are very good. At first my own reaction, even to the final enigmatic but disturbing lingering shot of Charlotte Rampling's face at the party, was a sort of, "Oh, is that all?" Actually all is plenty. When if gradually sinks in, this is a huge and wonderful film, with story, dialogue, and acting by the two leads good enough to make it seem already a classic. The film is quiet and subtle, like the misty flat lands outside Norwalk, in England's eastern midlands, where the couple lives. The details are mostly buried in the mannerisms and routines of an old couple. The film not only offers the coup for themselves and the director of presenting late-career triumphs by two of the best actors in English. It also gives a sense of the writer-director's intelligence, high seriousness, and consistency. It is a logical extension of his feature debut, even though Weekend is a gay love story about young men that comes at the start of their relationship and lasts only a few days while 45 Years comes at the opposite end of relationship and a straight but childless one and unfolds over the course of a week. Though he is barely forty, Haigh senses the compromises, buried resentments, deceptions and heroic patience often needed to make a long marriage work. Kate is a retired school director, Geoff a retired local foreman with old trade unionist passions, a tendency to overreact, and unwillingness to think the Thatcher regime had any positive side. Geoff is the man of Kate's life, as far as we now. But she discovers Geoff was listed as Katia's next of kin, because they traveled as man and wife in those more conservative days. Up in the attic are old journals and photographs. Geoff starts popping up there at night. Kate goes up one day when he is gone to town about a part for the loo. It's all quiet, muffled by the routine of a longtime couple. But there's an air of false bumbling about Geoff, and there is deep retrospective jealousy for Kate. Essential to the conception of Constantine's story is that the revelation comes shortly before the wedding anniversary celebration. It's about going on, preparing a face to meet the faces that you meet. Seeing Rampling's slim, perfect figure in the form-fitting light gray dress in the final party sequence one can't help remembering that she has lived in Paris for decades. To the usual English mantra of Keep calm and carry on is added a façade of Parisian elegance and coo. But with Rampling there is a lot rippling below the surface. In his five-star Guardian review from Berlin, Peter Bradshaw mentions Bergman's Scenes from a Marriage -- an obvious analogy -- and also refers to Brief Encounter, saying it sets both characters in the female role. Michael Haneke comes in for mention, and Caché. I myself thought of Julia Loktev's The Loneliest Planet, because of certain analogies of theme and setting, traveling in a remote place and finding a relationship shaken forever in an instant. Is Geoff guilty of cowardice? But the trouble with these comparisons is that 45 Years seems more naturalistic and low keyed. Geoff and Kate's times together -- especially a gently aborted effort at love-making -- are kind. In the end, it's all in Charlotte Rampling's face in that final shot. This is one of the year's best films and one that we may wish to study again to learn about acting and about life. 45 Years, 95 mins., debuted at the Berlinale where Rampling and Courtenay both won Silver Bear acting awards. UK theatrical release 28 Aug., US 23 Dec. 2015. I also think it's an instant classic if that means it feels "perfect" right away; it feels masterful and confident. I certainly would not call it "classical" because it's so subversive or "modernist" to be so coy and subtle about the changes in Kate's knowledge about him that a major change of knowledge is presented exclusively in visual form and there is no speech whatsoever that states what she learns when she sneaks into the attic and sees old photos of Katia. It was interesting to notice several patrons, when we showed it here, who totally missed this development or did not quite trusted their eyes because the issue is left not only unresolved but un-mentioned. This movie is a superb example of a type of narrative that revolves around the protagonist's "change of knowledge" (another common pattern of plot development is "change of fortune"). I've watched the film multiple times now and I think it's magnificent. Last edited by oscar jubis; 02-11-2019 at 06:57 PM. Good point: being coy about essential knowledge in a film is a modern thing, no doubt. Wouldn't another one be Ruben Östlund's Force Majeure. Also there would be Julia Loktov's The Loneliest Planet(NYFF 2011) - These are all sudden revelations of cowardice Another thing maybe modern cinephiles like - and are probably going to like even moe as time goes on and machismo is more discredited?